The first day of autumn is just days away, Sunday, September 23rd. I sense a shift in what I want to eat and drink. A new palette of foods and flavors usher in the new season; comfort foods and earthy flavors, like a big pot of “Real” Wild Rice Chicken Soup. Gone is the impulse to grab a crisp Sauvignon Blanc or a refreshing Rosé, that urge has been replaced by red wines and French white Burgundies like Domaine le Virolys Viré-Clessé, Chardonnay. Laurent Gondard owner of Domaine le Virolys is a 3rd generation winemaker. The estate is located in the heart of Mâconnais. The estate holds 17 hectares of vineyards in Viré and Clessé. 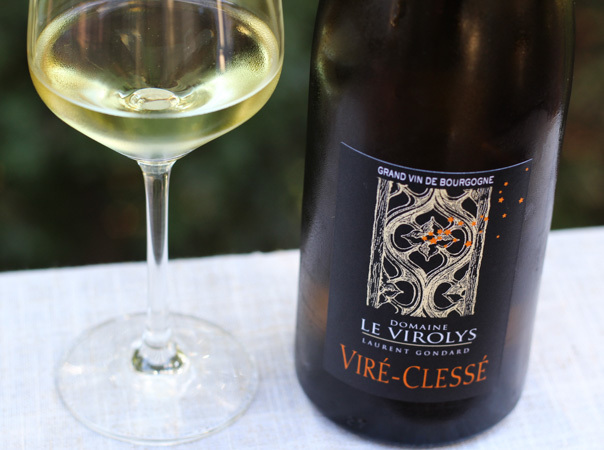 Viré-Clessé is an appellation created in 1999 producing only Chardonnary. Bright light golden straw in color. Medium+ acidity and medium bodied. On the palate notes of juicy citrus and ripe stone fruit with a balanced round mouthfeel. The Domaine le Virolys Chardonnay pairs nicely with “real” wild rice chicken soup. The weight and texture of the Chardonnay are matched with the lightened up half-and-half base of the soup. The balanced acidity in the wine cleanses the palate. The earthiness of the wild rice, onions, garlic, and thyme are echoed in the old world style of the Chardonnay. While the really chilly temperatures have not yet set in, I was craving wild rice chicken soup after my visit last week to Mill City Farmers Market in Minneapolis, Minnesota. I purchased some organic “real” wild rice from Sunrise Flour Mill. “Real” wild rice grows in lakes in Minnesota and Canada and is hand harvested. Unlike cultivated wild rice, a farm crop that is paddy grown. Cultivated wild rice is a hybrid developed by the University of Minnesota. I think real wild rice has more of a depth of flavor and much better texture, worth the price difference. The bonus is “real” wild rice cooks up much faster than cultivated. 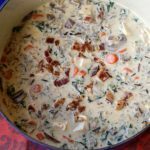 Wild rice chicken soup has been a long time favorite of mine, last year I came across a lightened up version in “Cooking Light” magazine. The recipe has less heavy cream, more vegetables, and flavor additions like a bacon garnish. 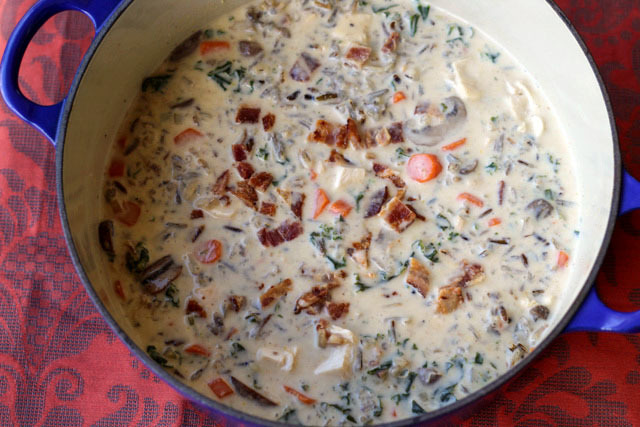 My “real” wild rice chicken soup is setting the mood for cooler temperatures ahead; I am ready to welcome in autumn. The cooler temperatures of autumn usher in a new palette of food and wine like "Real" Wild Rice Chicken soup paired with a French Chardonnay. Preheat oven to 350 F. On a sheet pan place bone in chicken breast. Drizzle with a little olive oil and season with salt and pepper. Bake for 40-45 minutes depending on the size of your chicken breasts. Preheat oven to 400 F. On a sheet pan lined with foil, place the 5 bacon slices. Bake for about 10 minutes. Turn bacon slices over and bake until bacon is just crisp. Place on a paper towel lined plate and let cool. In a dutch oven add one tablespoon extra virgin olive oil. Add onions, carrots, and celery; sauté for 3 minutes. Add the thyme, mushrooms, and garlic; sauté for 5 minutes. Add the chicken broth and one cup of water; bring to a boil. Reduce the heat and simmer for 8-10 minutes. Add the chopped kale, salt and pepper; simmer for 3 minutes. Stir in the chicken and wild rice. In a small/medium size bowl combine half-and-half and flour. Whisk together until well mixed. Slowly stir the mixture into the soup; continue to simmer for about 2 minutes or until the soup thickens. To serve; ladle soup into bowls and garnish with chopped bacon pieces. Like your style of greeting autumn! Your soup looks heart warming and, we’ll delicious. Closing my eyes I can imagine the flavors of both soup and wine. Was it an almost perfect pairing?! ?